Building the church. Equipping the leaders. On April 7th & 8th, our partner churches are all coming together to baptize as many people as possible. We'd love for you to join in the fun! It's the weekend after Easter and is a great time to do baptisms. This all started for us when we realized that many of the churches we are getting to know haven't baptized anyone in the last year. So, this pushed us to get some resources in the hands of our churches and we wanted to share them with you! 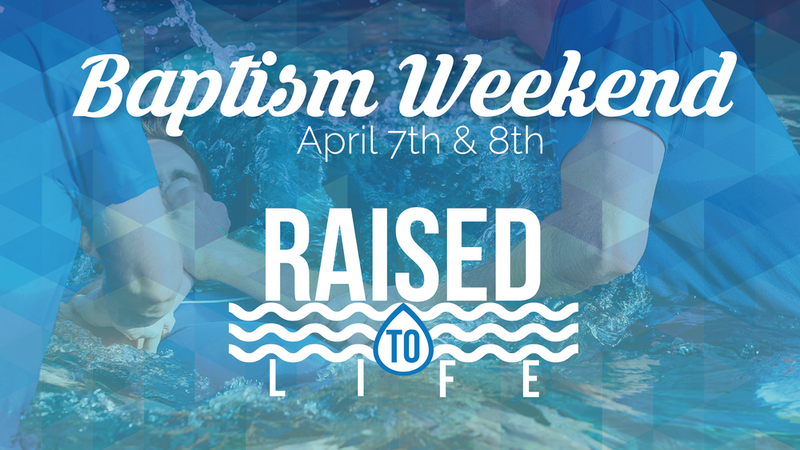 We're big fans of planned and spontaneous baptisms all rolled into one weekend. It's pretty powerful to see 1, 2, 10, or even 100 people baptized in the same weekend. Let's get excited about helping people put their faith on display for the world to see. Now is the time to start asking people if they're ready to get baptized. If someone has recently given their life to the Lord, get them scheduled for baptism on April 7/8. Have your kids and youth leaders and volunteers start having Gospel conversations with students and kids. Get them scheduled. Talk about it, promote it, and get people excited about the event! When baptism weekend arrives, we suggest doing a sermon or at least a 5 minute talk specifically around baptism to explain it in depth. Why do we do it? What does it mean at our church/in our denomination? Did Jesus do it? You can do it in the service or directly after. We always like putting a temporary pool right up front and worshipping while it happens. I always preach in my swim trunks (mostly because we baptize during the service) on baptism weekend to make it easy and to remind people of the importance and the event. You can see some video from one we did a couple years back. It never gets old! We'd love for you to shoot some video and share it with us! We're going to create a compilation just like this one. 1. Order of Service. Here is an example of our order of service when we do baptism weekend. 2. The excuse eliminator packet! If you choose to do spontaneous baptisms, in addition to the scheduled ones, have extra towels, dark shorts, baptism t-shirts, underwear, socks, and hair brushes in a few different sizes on hand. We call this the excuse eliminator packet. No excuse for not being obedient on that day! You'll want to divide them out into different size groups and have them available for people to get changed. Walmart has tons of cheap supplies for something like this. 4. Baptism Resources. We've put together a ton of free baptism resources for you and your church to use. We also have a t-shirt available or the graphic to create your own. 5. Dream big! Just before the invitation, you're going to have a moment of doubt about this whole thing. Satan will want you to pull back and will do anything to keep you from preaching the truth with boldness and confidence. Don't give in. Preach with conviction, make the ask, and let's help people go public with their faith! Take lots of pictures and use the hashtag #RaisedToLife2018. If you'd like your video to be included in the wrap up, share pics and video by sending them to chris@theministrymechanics.com or call 832-993-5570.